Barter Books : Chapman, A F P; Fender, P G H; Franklin, W B et al. 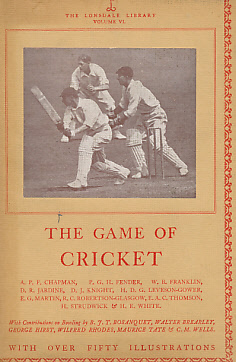 : The Game of Cricket. The Lonsdale Library. Volume VI. London. : Seeley, Service and Co., Ltd.
220 x 145 mm (9 x 6 inches) - 255pp. G : in good condition with rubbed and edgetorn dust jacket. Jacket spine darkened and edge-chipped. Inscription and date to fep.